Planning your summer vacation in Lake Louise has never been easier! We have great adventure activities to suit any age or ability! Browse through our adventures or call our office at 1-877-CAN-ROCK or 403-678-6535 to speak to a reservation agent! Rafting at its best! Raft the mighty Kicking Horse River, a surefire way to get your heart pumping and the adrenaline running! No crowds, guardrails, just stunning views as far as the eye can see. Beginners to experienced riders are welcomed! The newest Eco-Tour everyone is raving about! Come soar on three exhilarating dual ziplines that descend down the mountainside, crossing the majestic Kicking Horse River. 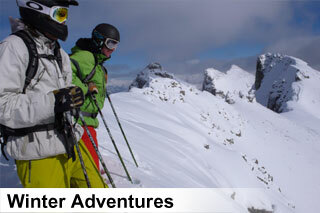 Customize your own adventure - hike, scramble, climb or ski tour in the Canadian Rockies. Our Nationally & Internationally certified mountain guides can customize the trip of a lifetime! CLICK HERE TO SEE OUR WINTER ADVENTURES!